Despite what The Phi may proclaim after every meal, I am not the best cooker ever. In fact I am not very good at it at all. So for The Phi's birthday I decided that I wanted to take cake pops for her class on Friday. (Her birthday is on Sunday). So last weekend I did a trail run. Now they are pretty simple but have more steps than a Hamburger Helper meal so for me it was tough. There are a couple of steps that I think are crucial to the process. Styrofoam or something equivalent to hold pops. 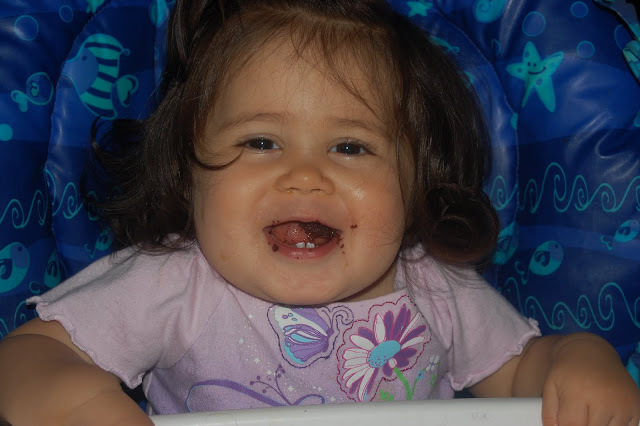 Step One We Can Have Lots of Fun: (okay I am totally going to be singing that NKOTB song in my head the WHOLE time!) So first you bake a cake. Just grab a box, add eggs, oil and water and bake that bad boy up. Let is cool. Step Two There's so much we can do: Break up the cake and put it into a bowl. 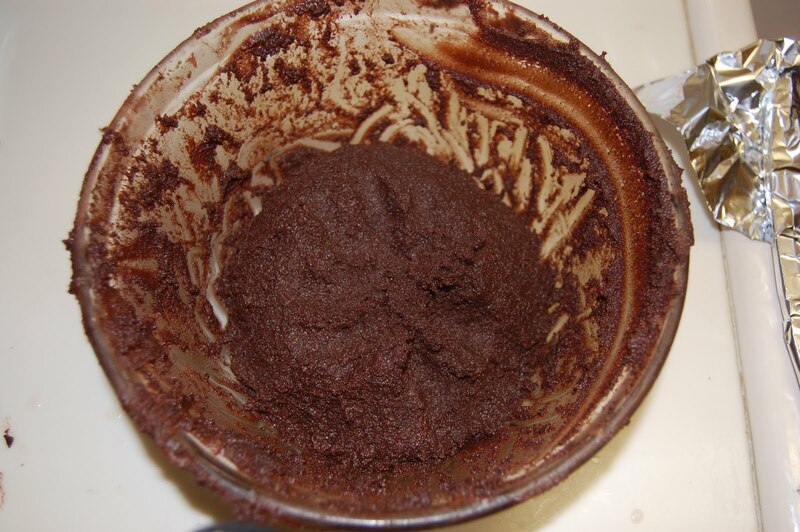 For this trial run I used Devil's food cake. Step 3 It's just you and me: Here is one of the crucial steps of the process. YOU MUST give Lou some chocolate cake. 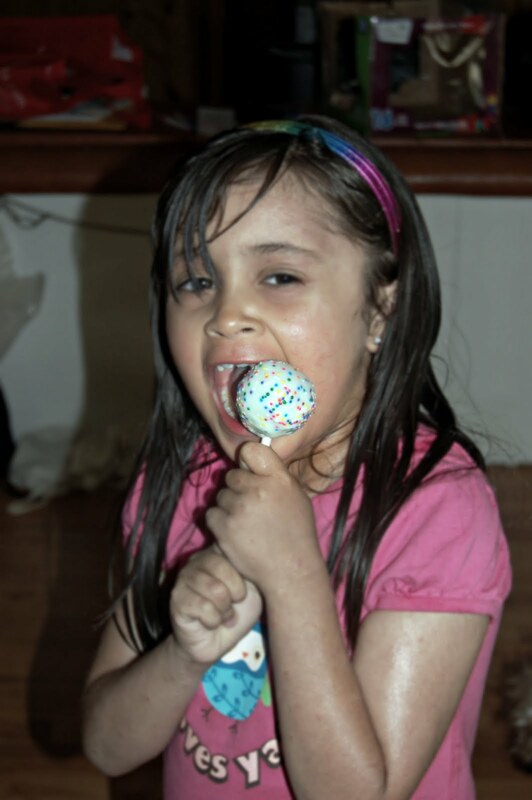 If you skip this step she will cry and scream and yell and you will not be able to finish your cake pops! Step 3= a happy Louella. Step 4 I can give you more: When I read this step I thought I had stumbled upon a bad recipe. So I checked some more and they all said the same thing. Add a can of frosting to the cake and with your hand mix together. I do not like mushy sticky things on my hands so this part was not fun for me. I keep mixing and mushing and it wasn't coming together like I wanted, or like all the fancy pictures on the line. I found out about half way through that some water on your hands makes the process easier. Step 5 Don't you know that the time has arrived!- Next you roll out some balls. Again, water on your hands. Moisture is your friend. Now these here are way too big. 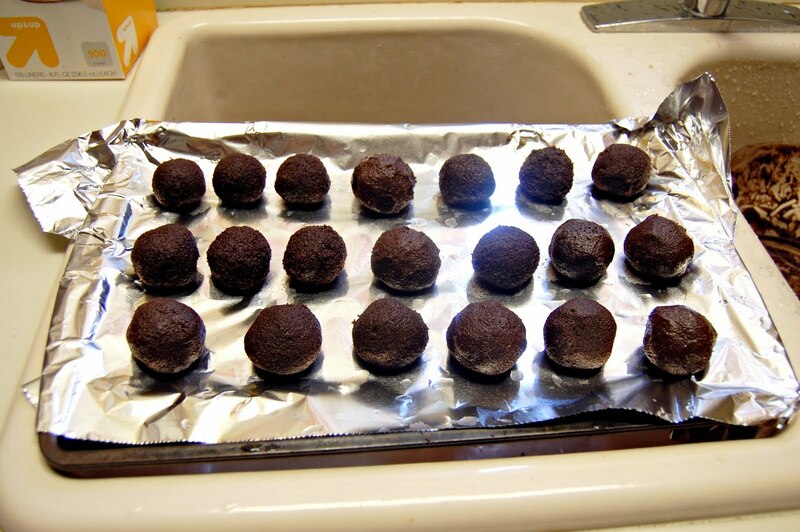 One cake should make about 40 balls. I only ended up with 20. So think about half this size. Step 6 Sorry there were only 5 New Kids: Next you need to add the sticks. To do this you will first need to melt just a little bit of the chocolate. For this trial run I used white chocolate. White chocolate is also good to get because you can add food coloring to get any color you want. So you melt the chocolate 30 seconds at a time until s-m-o-o-t-h! Then dip one end of the stick in the chocolate and then into the cake ball. This will help "glue" the stick to the pop. Even with my giant sized balls (hahahahaha) they held on the stick perfectly. You are also going to need something to hold your pops while they dry. The internet suggests thick Styrofoam of floral block. Being the cheap brilliant people that we are Joey made me one with an empty box of fruit roll ups taped into a shoe box with holes on top. It worked like a charm. 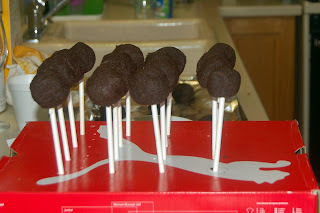 Step 7 told you this was harder than making Hamburger Helper: Time to dunk the balls in melted chocolate. (HAHAHAHA) Melt the rest of the chocolate. 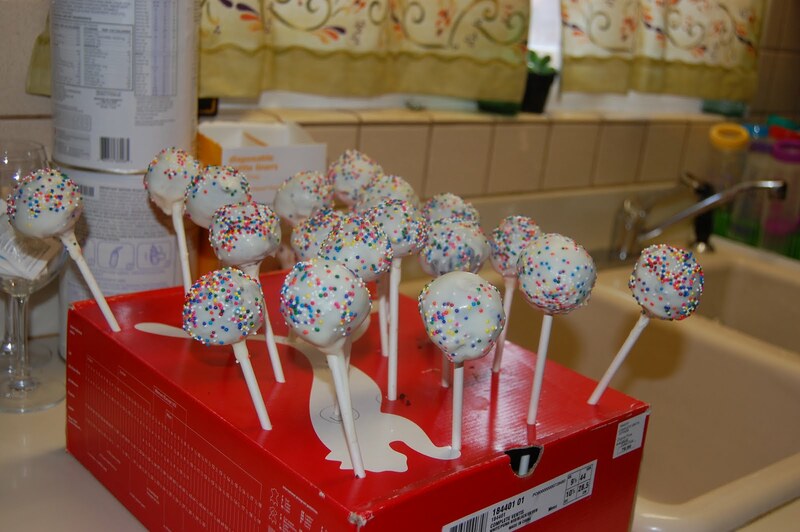 It's easier if you use a bowl deep enough to cover the whole cake pop. 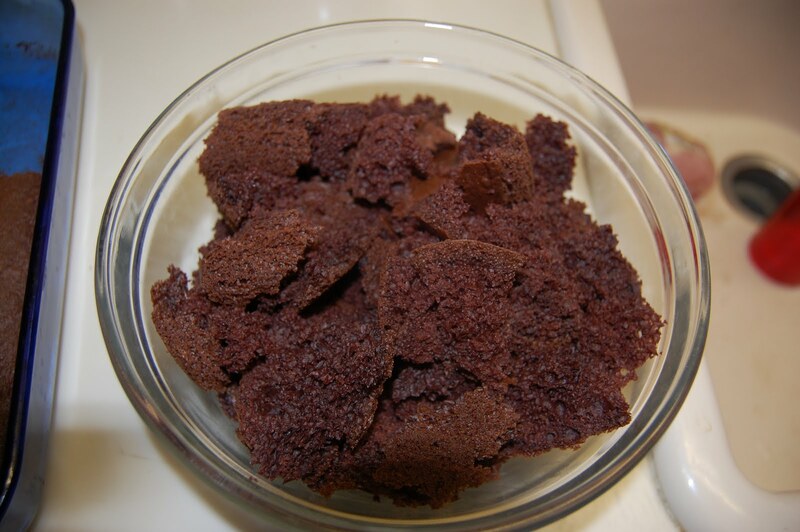 I also added about a tablespoon of vegetable oil to the chocolate to thin in out a little bit. I didn't get pictures of this step because Lou refuses to learn how to use my camera. 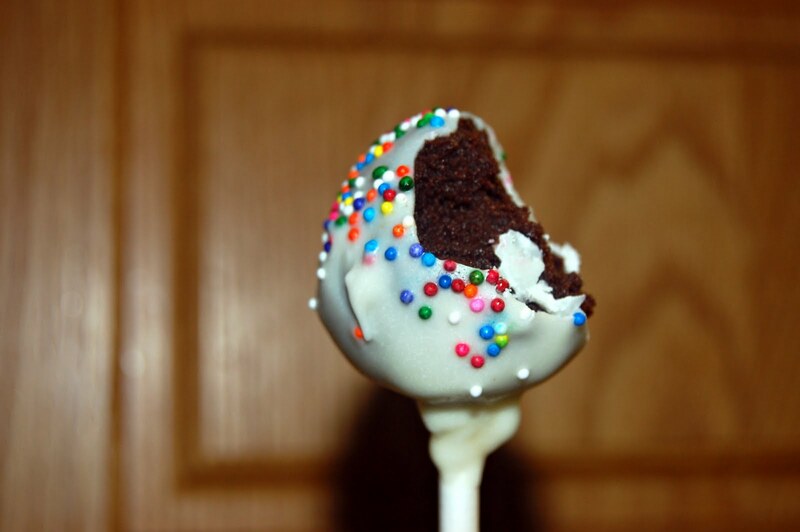 Anyways you dunk the cake ball into the chocolate. Cover the whole thing. 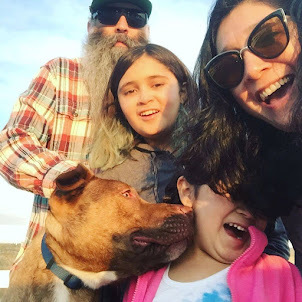 Then is the hardest part for me. You have to hold it over the chocolate to let the excess drip off. Then add something fun! We added rainbow sprinkles. 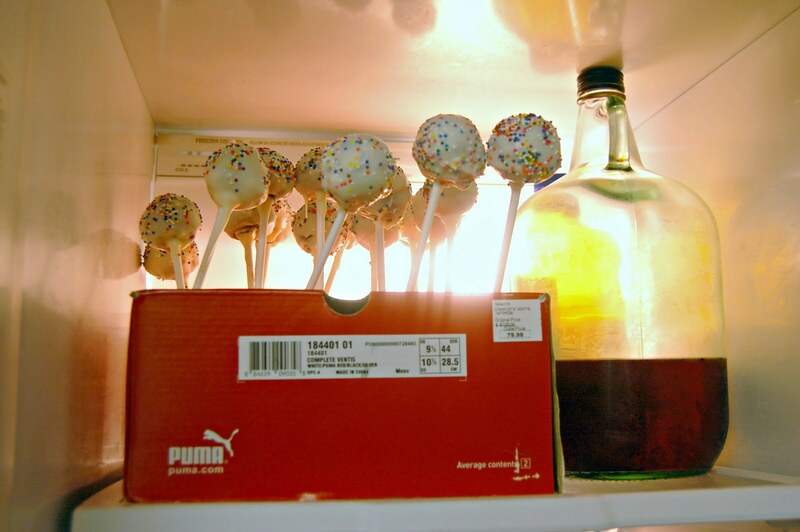 Step 8 ANOTHER CRUCIAL ONE: Put your cake pops in the fridge, but here is the important part. You have to put them next to your giant jug of wine. If you do not do this I cannot guarantee how your cake pops will turn out. Step 9: Pass out to people and let the praise roll in!!! "Whaaaaaaaaa" - Lou crying because no one would give her one. I was laughing the whole time I was reading this post. I'm waiting for you to write a book. I love how the baby knows her damn cake rights haha. Looks like they turned out great! OK, I will be brave and make them. Sometime. But not today.